...it's a completed color challenge. 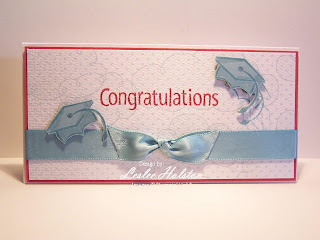 I was in need of a graduation card and FAST! So, naturally, I turned to SCS for some inspiration. This week's color challenge CC223 is to use Baja Breeze, Ruby Red and Whisper White. Perfect! The first paper that came to mind was the Sweet Slumber Specialty DSP. I took one look at the clouds and knew I had to use it. Grad hats flying in the air and, well, the sky's the limit! There! I had my inside sentiment (which I printed from my ink jet printer onto card stock). The sky's the limit! I dug out the only graduation stamp I had...a grad hat in the old, long retired Little Layers Plus set. 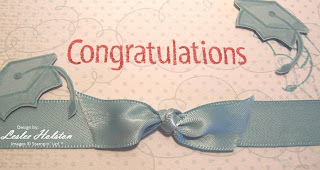 A little layer of Ruby Red, some Baja Breeze satin ribbon from the Valet Ribbon Originals on a Whisper White card base, a couple of Baja Breeze grad hats and the congratulations sentiment inked in Ruby Red. It's done! I don't normally make odd sized cards but, like I said, it had to be fast. I folded a 6" x 6" pc. of Whisper White in half. The finished size of 3" x 6" is perfect for holding money or a personal check. Quick note: When I stamped my sentiment onto the textured specialty DSP, it left small white spots in the stamped image. Because of the texture, the stamp didn't get a good flush contact with the paper. To eliminate those white spots, I used the small detail tip of the Ruby Red marker to color in the spots. Thanks for stopping by today. Come back soon! Remember, the sky's the limit to your creativity!